Abstract: Traditional 3D printers fabricate objects by depositing material to build up the model layer by layer. Instead printing only wireframes can reduce printing time and the cost of material while producing effective depictions of shape. However, wireframe printing requires the printer to undergo arbitrary 3D motions, rather than slice-wise 2D motions, which can lead to collisions with alreadyprinted parts of the model. Previous work has either limited itself to restricted meshes that are collision free by construction, or simply dropped unreachable parts of the model, but in this paper we present a method to print arbitrary meshes on a 5DOF wireframe printer. We formalize the collision avoidance problem using a directedgraph, andpropose an algorithm that ﬁndsa locallyminimal set of constraints on the order of edges that guarantees there will be no collisions. Then a second algorithm orders the edges so that the printing progresses smoothly. Though meshes do exist that still cannot be printed, our method prints a wide range of models that previous methods cannot, and it provides a fundamental enabling algorithm for future development of wireframe printing. Abstract: Current interactive fabrication tools offer tangible feedback by allowing users to work directly on the physical model, but they are slow because users need to participate in the physical instantiation of their designs. In contrast, CAD software offers powerful tools for 3D modeling but delays access to the physical workpiece until the end of the design process. 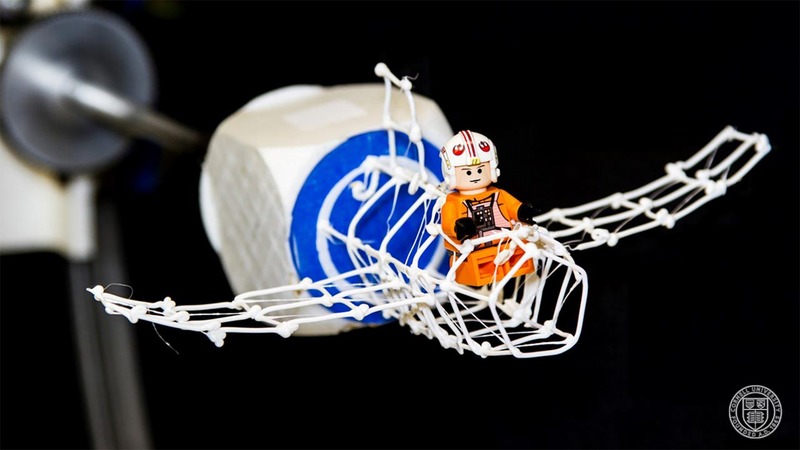 In this paper we propose On-the-Fly Print: a 3D modeling approach that allows the user to design 3D models digitally while having a low-fidelity physical wireframe model printed in parallel. Our software starts printing features as soon as they are created and updates the physical model as needed. Users can quickly check the design in a real usage context by removing the partial physical print from the printer and replacing it afterwards to continue printing. Digital content modification can be updated with quick physical correction using a retractable cutting blade. We present the detailed description of On-the-Fly Print and showcase several examples designed and printed with our system.